My kids have become huge fans of these audio dramas! 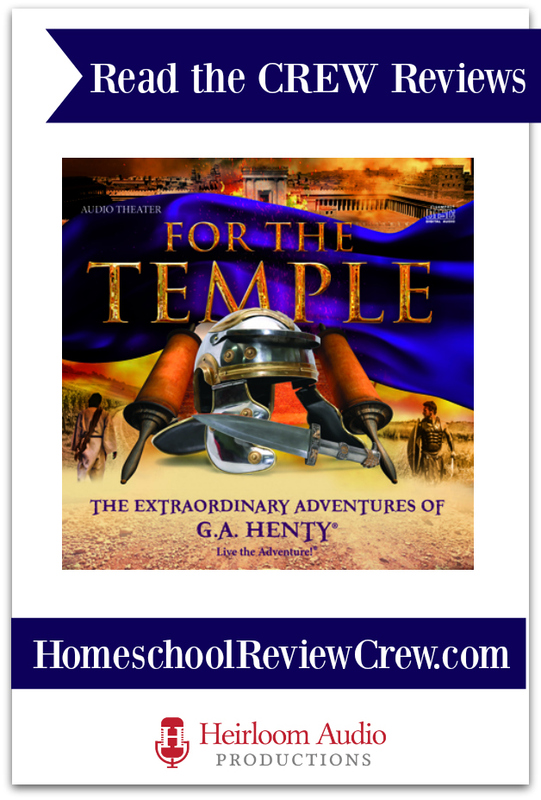 The latest that we have checked out is For The Temple from Heirloom Audio. Whenever one of these CDs arrive from Heirloom Audio, my kids will always take off with it. Once that happens, I know that I won’t see them for a few hours while they soak in the story. This time, my 12 year old son took off with it, but that’s okay since he’s helping with the review! G.A. Henty is out on a coffee break when someone runs into him. George tells him of a story about a jew named John, who was a gardener at his father’s house. John is out on a boat trip with Mary, who is betrothed to John, when a storm comes and sets them out of the way. They are saved by Jewish fighters, who were also sailing. John decides to join the army against the Romans, since the Jews first and foremost duty is to protect the Temple. John fights many battles, survives, but loses many friends along the way. When he decides to fight again, Mary tries to keep him away from the fights. Finally, the Romans are on the move toward the Temple and John has to do what ever it takes to defend it. Even if it means he has to put together a rag-tag gang against the Roman camps, while uniting bands of murders, John will do whatever it takes. One of my favorite parts is when John and his rag-tag gang go about terrorizing the Romans. They blow horns, they take down tents, and set fire to Roman tents. Another one of my favorite parts is when John and Titus are fighting. First Titus has the upper hand but he finds out that John is a very experienced fighter. John wins the fight and forces Titus to promise to do in all his power to spare to Temple. My favorite character in this audio drama is John. He is brave and very faithful. My least favorite character is Titus. He made a promise and could have easily ordered his men not to attack Jerusalem at all. I like this CD set since it has a good story, a good plot, and a good amount of action. The only thing about this that I don’t like, is that at the end of it, John and his friend end up in the hands of slave traders. One neat feature of For The Temple audio drama is the study guide. It includes “Listening Well”questions and “Thinking Further” prompts to help create discussions with your children. There are also “Defining Words” listed that are good to go over with your children to make sure they understand what they mean. Also included in the study guide are interesting tidbits about the area and customs. For more information, please visit the Heirloom Audio website or check out For The Temple. The 2-CD set can be purchased for $29.97 plus shipping and handling. We also recommend reading our reviews on other Heirloom Audio dramas. You can also find out more on Facebook, Twitter, Google+, and Instagram. You can click the banner below to read more reviews on this product and others by other homeschooling families.